The mega news: Solar Power Generation reaches over Five Thousands MW in India by Mid-Jan’15 - that is a break through. Where as round 1400 Mega Watt installed capacity results in the cumulative Installed capacity to become 5100 Mega Watts, the Indian States are forging ahead with the Solar Power generation rising as the State of Rajasthan tops the tally with as much as 1264.35Mega Watt followed by Gujarat, and Madhya Pradesh is the third [with about 680 MW capacity]. The Government of India, foresees that by March,2022, a One Hundred Gega Watts Solar Power Generation would be reached. The strategy would be of two pronged efforts – that is, Govt. is gearing up by means of grid-connected Solar-power - roof-top grid-connected - upto Forty Gega Watts and together, the ground mounted grid-connected Solar-power being around Sixty Gega Watts. The Govt. proposes that the progress is made with regular monitoring on yearly basis to reach to that ambitious figure of One Hundred Gega Watts. The opportunities would begin to roll out from April,2016 as target to chase for the year 2016-17 is set - it being 12000MW. The Govt. 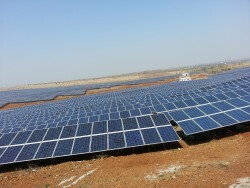 of India plans to start several schemes of Solar Power Parks and others, to attract slow runners in the drive. As regards the present scenario with other States, the Solar Power generation at Maharashtra and Andhra Pradesh is only as much as around 380 Mega Watts and 357 Mega Watts – which is quite a gap from that of Rajasthan. The challenge would be to drive into target slots slowly but steadily.